Torrington on flat ground high above the River Torridge, situated in the rolling, sometimes wooded countryside of North Devon. 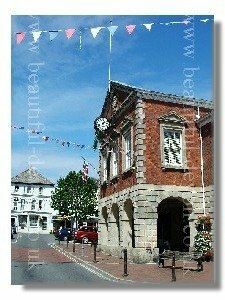 Mentioned in the Doomsday Book, the town has always been valued for its strategic importance no more so than during the English Civil War. The fine brick faced building dominating the Torrington town centre is the town hall, inside which is the Heritage Museum. Learn about town's role in the Civil War, the Canal Age, the coming of and demise of the Railways. Visit the Torrington 1646 attraction Explore the delightful Pannier Market, opened over a hundred and fifty years ago and now with a new fine timbered roof. In Fore Street, is the Plough Arts Centre, a theatre, cinema and art gallery all rolled into one building, formerly the Plough Inn, hence the centre's name. Torrington Commons. Perhaps the towns' greatest asset are its Commons, 365 acres surrounding the town on three sides, with nearly 20 miles of footpath, ancient woodland, flora and fauna rich grassland, (in fact over 25 species of butterfly). Extensive views over the steep Torridge Valley Nearby is the Tarka Trail winding along a disused railway line. The former Station Master's house is now a pub the Puffing Billy. On the low ground far below the town is Taddiport with its fine 3 span late 17th century bridge and the nearby thatched Torridge Inn. Though this is today a sleepy hamlet, in the 19th century the village was bustling with activity. The Rolle Canal had opened in 1827 bringing limestone and coal for the limekilns and exporting ball clay from the nearby pits at Peters Marland. Sadly very little remains of the Canal today. The stretch upstream of Taddiport towards Town Mills was filled in and used as a Toll Road, now offers a fine woodland walk alongside the river. Three miles down river from Torrington is Weare Giffard, at the navigable limit of the River, note the lime kilns just downstream of the bridge? Visit the Holy Trinity Church with its fine hammer beam roof. On the outskirts of town is Dartington Crystal- take a factory tour. Buy an exquisite hand made piece from the shop. RHS Rosemoor Gardens laid out over a 40 acre estate overlooking the River Torridge Valley. Opened to the public in 1990. Formal gardens, cottages gardens, a potager, Lady Anne Garden, herbaceous borders, a fern gully, and stream and bog gardens. Rosemoor is a mile south of Torrington, in North Devon. Tarka Trail Feeling fit why not explore the Tarka Trail, either on foot or by cycle?. 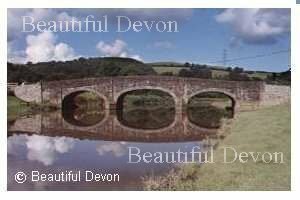 Head inland through the undulating Devon countryside towards the clay pits of Peters Marland and the Trail becomes less popular with tourists. Head down river towards Bideford and the Torridge becomes tidal. Left your bike at home? Bikes can be hired at the outlet next to the Puffing Billy as well as other cycle hire shops along the Trail.